IN TYPICALLY DISRUPTIVE FASHION, tonight's CESI Meet includes several Hangouts On Air. The first one will air at 1919 CESI Time with a half dozen more through 10PM. This is a real test on several levels because I have no idea if the proxy running on the Thurles campus will permit Hangouts. Worse still, the Dell Precision M2400 laptop I have does not let me join campus wifi. Fortunately, help is at hand in the form of both an O2-Ireland Hotshot (delivering better than 1.2 Mbs upload speeds when I tested it yesterday on campus) and a Vodafone Mobile Broadband USB modem (offering better than 7 Mbs over the air in Thurles when tested). But connectivity is only part of the problem. 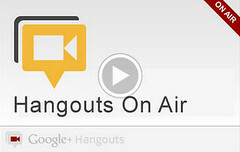 From experience, I know these Hangouts tax the patience of viewers more than watching cats dance on keyboards. Although they might be serendipitous, they waste a lot of bandwidth. That said, a Hangout on Air shaken and stirred CESI Meet Energy will deliver decent white noise. You can judge for yourself because when we finish each five to seven minute segment, the Hangouts will go to the ICTedu playlist on Topgold's YouTube channel. If you have questions you'd like answered, leave them on my InsideView blog post. Or if you like, shout them into the Hangout. We're prioritising questions from people using mobile handsets to join the Hangout and we're screenscraping the event for a tight showreel of the First CESI Meet Live On Air. Watching the #CESImeet today. Bernie Goldbach curates links about Google.